Philately and the modern day Olympics have a symbiotic relationship starting with the first modern day Games held in Athens in 1896 when Greece issued a series of stamps to mark the occasion. These stamps actually contributed to the financial success of the event which had been impacted by the financial and political crisis of the times. Demetrios Sakorafos, the founder of the Greek philatelic association, had the idea of issuing a set of commemorative stamps with a nominal value higher than that of common postage stamps, the proceeds to go toward the fund for holding the Olympic Games. The stamps, with designs featuring ancient Greek athletic competitions, earned a considerable sum of money, and the Greek Post became the first sponsor of the Modern Day Olympic Games. Initially only the Olympic host countries issued stamps to commemorate the Olympics, however this tradition later ended when other countries alongside France issued stamps for the 1924 Paris Olympics. The Uruguay football (soccer) players, participated in the Games for the first time, earning their country’s national team its only gold medal for Uruguay. Their victory in soccer motivated the Uruguay postal service to issue Olympic stamps which featured Nike, the Greek goddess of victory. As the Olympic movement gained in popularity, interest in commemorative stamps grew among philatelic collectors. More stamps were published featuring specific athletes and sports. Portugal was the first to print the Olympic rings on stamps issued for the 1928 Amsterdam Olympics. Again, part of the proceeds from selling these stamps at higher prices went toward funding the Portuguese Olympic Committee. The 1948 London Olympics marks the start of mass production of Olympic commemorative stamps. Since that time, these stamps have become part of Olympic history, marking athletes’ victories and other important milestones. 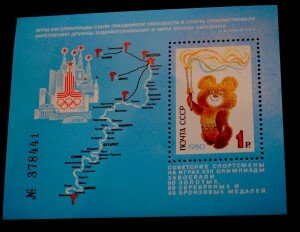 Soviet stamps issued for the 1980 Moscow Olympics featured various sports and Olympic venues: the Krylatskoye Rowing Canal, the cycling track and the sailing center, as well as Red Square and the 1980 Olympics mascot, Mishka the Bear. When more than 50 countries boycotted the games, these countries also cancelled their planned postage stamp issues or destroyed the issues printed. 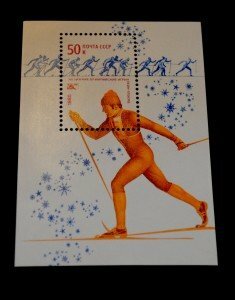 This was the case with the West German stamps published for the Moscow Olympics. Only three sheets survived: two were taken to the archives, while the other was appropriated by Kurt Gscheidle through his position as Minister of Post and Communications. The stamps, which featured a streaming Olympic flag, even found their way into service when the minister’s wife and son found the stamps at home and used them to post letters. 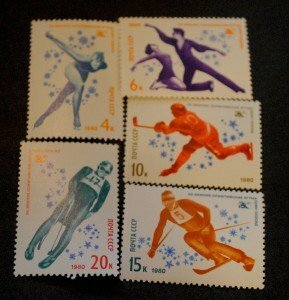 The rare West German 1980 Olympic stamps are referred to as the “Gscheidle stamps” by collectors. The US issued a variety of stamps for the 1980 summer games, replacing the five Olympic rings with five stars on those stamps. Unlike the other countries boycotting the event, the US did not destroy the stamps. The ever increasing popularity of Olympic commemorative stamps was becoming so great that a special body was set up under the International Olympic Committee (IOC) patronage in 1982. The International Olympic Philately Federation (FIPO), has conducted the Olymphilex world philatelic exhibitions since 1985. Since 1984, the IOC and FIPO have awarded the annual Prix Olympia, honoring the three most attractive postage stamps issued by post agencies of various world’s countries on the occasion of the Olympic Games. 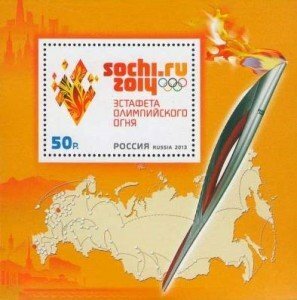 Russia began issuing commemorative philately materials dedicated to the Sochi Games in 2011. 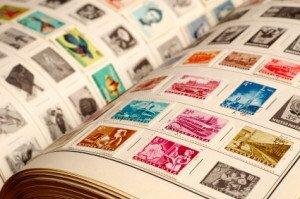 The plan is to issue a total of four souvenir sheets — small groups of postage stamps still attached to the sheet on which they were printed, 45 stamps featuring various designs, 41 artistic stamped envelopes, and 15 stamped postcards. A special souvenir sheet is devoted to the Olympic Torch Relay. 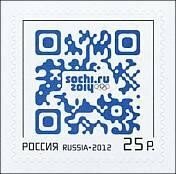 It was put into circulation on October 7, 2013, on the day the Russian stage of the relay kicked off. 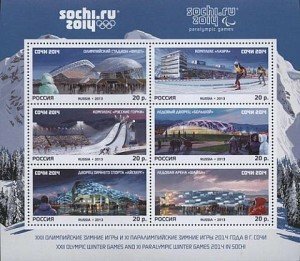 The stamp features the relay’s emblem, and on the margins one can see the map of Russia, the Olympic Torch, the Moscow Kremlin and the Sochi Seaport Terminal building. 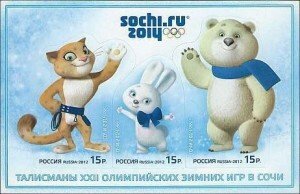 Russian Commemorative stamps and souvenir sheets of the Sochi Olympics can be ordered from the Hungarian Stamp Exchange by emailing your request to [email protected] and will be available in approximately one month. We hope you will enjoy the 2014 Sochi Olympic Games! New Year’s Greetings and our new online store! While our New England weather has provided us with a quirky start to the New Year, the world of Eastern European philately is looking forward to a bright and exciting year.We hope you will enjoy reading the article we assembled on the philately of the modern day Olympic Games and take some time to browse in the Hungaria Stamp Exchange online store for stamps issued by the Eastern European countries and Greece. Click the link to the HSE store and you may notice that we have been busy redesigning the store. We hope you will enjoy the visit! Click here to visit our new store! And we would love to receive your feedback on the new design. Happy New Year to you and your family from all of us at the Hungaria Stamp Exchange. We truly appreciate your patronage and look forward to an exciting philatelic year together in 2014.